No matter how confident they feel about their relationship every bride worries her future spouse will croak at the altar come the big day. 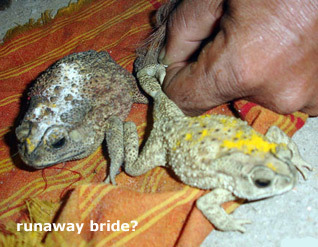 But in a number of different parts of India, croaking is the norm during some much-celebrated Hindu weddings. 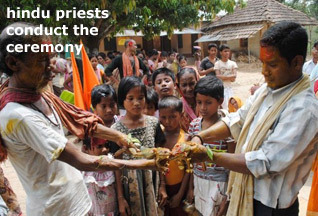 Five Hindu priests chanting scriptures pronounced "you are now frog and wife" to a groom named Punarvasu and his amphibian bride Pushala, who were joined in holy Hindu matrimony by villagers, hoping the ancient custom will bring monsoon rains to their drought-stricken district. Organizer Nandkumar Pawar says thousands of people gathered Thursday, July 12, 2012, in a massive tent in Patkhal village for the lavish wedding banquet. He said Saturday (July 14) that the frogs were decorated with flowers and smeared with turmeric, a holy and auspicious ointment. A brass band played Bollywood film songs while the priests blessed the frogs. The region in southeast Maharashtra state, not far from Mumbai, India's financial capital. Similarly, two frogs - Barun and Bijuli - were joined in matrimony in another traditional Hindu ceremony in Hengrabari, in the northwestern Indian state of Assam. Again, it wasn't the result of an amphibian romance, and neither of the frogs turned into a prince after being kissed. This is what many Hindu-Indians do to end a dry spell if it leads to severe water shortages. Unless, of course, they can divert the waterways flowing through Punjab. 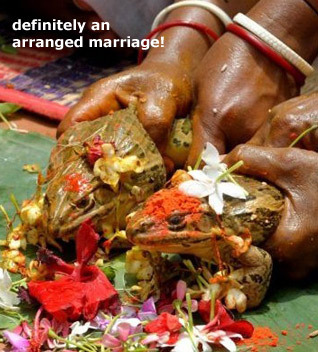 "It's a traditional belief that when a frog marriage is performed, the Barun Devata [the Hindu rain-god] is pleased and the rain comes," former councillor Bijoy Das told The Hindu newspaper. 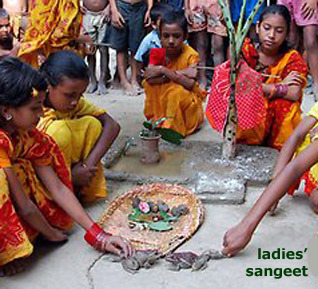 The wedding of the frogs -- male Barun (meaning wind) and female Bijuli (meaning thunder) -- was accompanied by all the usual traditions, including songs and gifts presented to the bride. The amphibians were then fed a special celebratory lunch of flies and mosquitoes. After the ceremony, the happy couple were sent on their honeymoon -- by being released into a local stream. The news was not so good, however, for a male toad who attended the ceremony, who died during the proceedings. 1: Jaswinder Singh (Brier, Washington, U.S.A.), July 15, 2012, 6:25 PM. If a Sikh (Jagmeet Samundri) makes a movie and wants to show warriors riding horses in it, the censor board wants him to take that scene out because they consider it animal cruelty and if Hindus do frog weddings and a frog dies, it's considered a religious ritual. If India keeps treating it's minorities like this, in the near future, India will be broken into a lot of small states, like in the pre-British era. Comment on "India Takes Extreme Measures to Handle Drought"